It’s time for Thursty Thursday! 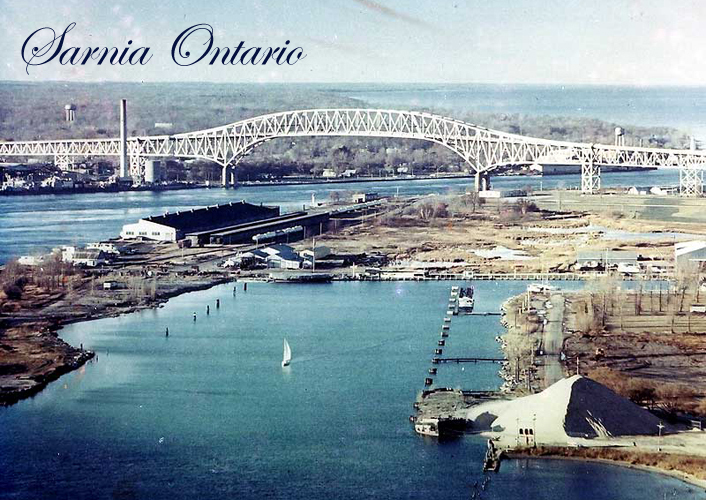 Let us first begin by wishing our friendly neighbours to the south a very Happy Thanksgiving! We would also like to give thanks to our U.S. friends for introducing us to the all-american game of football. If not for your great invention, we would be Christmas shopping early (instead of watching the Grey Cup this Sunday) In return, we would like to offer you a twist on one of ‘our own’ national treasures, the Caesar. 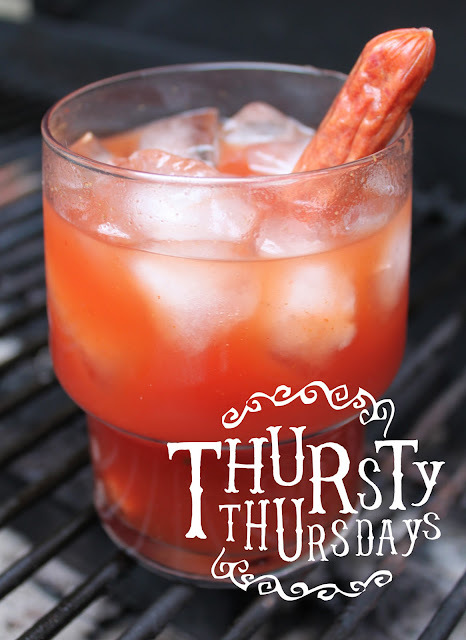 Today’s Thursty Thursday cocktail is named the Grilled Caesar. If you want to learn more about our brand visit www.proofbrands.com. Become a friend on Facebook www.facebook.com/proofbrands and Twitter http://twitter.com/proofbrands to get last minute updates on all of our tastings, parties and events. * TIP: Don’t cheap out on the clamato. Mott’s still makes the best clamato and it will make a HUGE difference in your drink www.mottsclamato.ca We definitely prefer Motts Original recipe because we like to adjust spice and flavour according to taste. If you prefer a spicy rim on your caesar, try Motts Clamato Rimmer instead of the celery salt. Pitcher size: (don’t miss the game) To a pitcher, add 1 ½ oz. cups proof whisky, 2 tbsp. BBQ sauce, ¼ cup lime juice and 4 cups Motts Clamato. Stir to mix. Method Bring all ingredients to boil in saucepan over medium heat, stirring occasionally. Reduce heat; simmer until sauce is reduced to 2 cups, stirring often, about 10 minutes. It can be made 2 weeks ahead. Cover; chill. Use at room temperature. 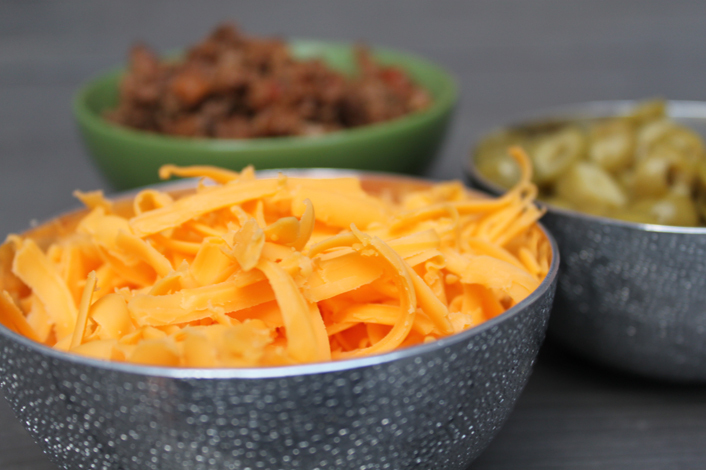 If you’re thinking of having the guys over to watch the game this Sunday http://greycup.cfl.ca , you better first stock up on some Grey Cup staples – I am talking meat and more meat. 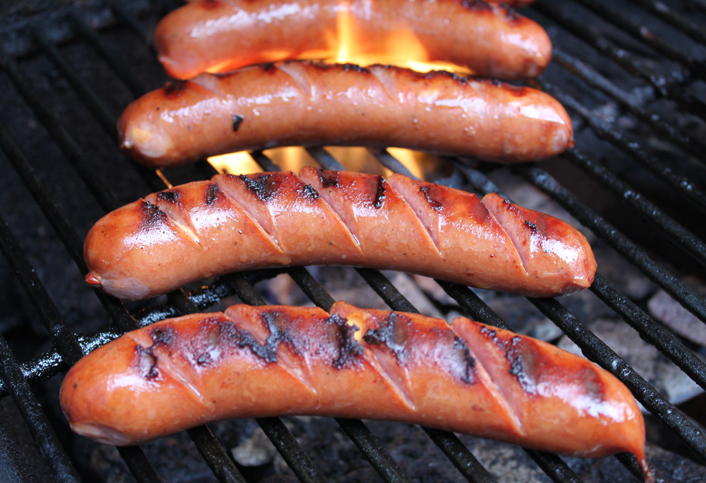 Chicken wings, short ribs, red hots, sliders, cheeseburgers, bratwurst, kielbasa – they’ll all do. 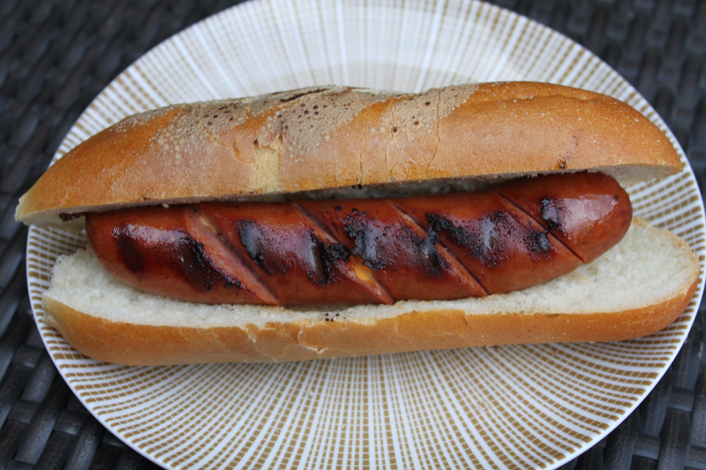 Or you can keep it simple – throw some franks and bratwurst on the grill and set up a smokin’ condiment bar. You can pick up some quality dogs at your local butcher, or visit Mac & Mark’s little unknown shop, M & M Meat Shops www.mmmeatshops.com They have a nice variety of fire-roasted Beer Bratwurst, Oktoberfest and Big Reds. They’ve been serving Canadians since 1980 for a reason. Mayonnaise, ketchup, spicy ketchup, Blue Cheese Dressing, refried beans, tomato chutney, mango chutney, apple chutney, apple butter, cranberry chutney, maple syrup chutney, Crushed Red Pepper, Colby Cheese, blue cheese, cheddar cheese, swiss cheese, pepper jack cheese, cream cheese, taco sauce, Cottage Cheese, Chopped Cilantro, Pinto Beans, salsa, salsa verde, guacamole, avocado, sour cream, canned tuna, shrimp salad, potato sticks, potato chips, garlic mashed potatoes, anchovies, chives, sweet pickles, dill pickles, hot pickles, green peppers, red peppers, banana peppers, jalapenos, pastrami, hummus, baba ganoush, french fries, raw mushrooms, fried mushrooms, peanut butter, butter, salad dressing, wasabi, black pepper, egg salad, fried eggs, chopped boiled egg, steak sauce, bacon, sundried tomatoes, black olives, green olives, minced garlic, minced basil, horseradish, lettuce, chopped cucumbers, sprouts, sunflower seeds, honey, cabbage, pizza sauce, spaghetti sauce, hot sauce, barbecue sauce, salsa, crushed pineapple, cream cheese, potato salad, pepperoni, chili sauce, ketchup, Dijon mustard, spicy brown mustard, honey mustard, sauerkraut, coleslaw, chopped onions, caramelized onions, green onions, dijonnaise, prosciutto, melon relish, onion relish, spiced apple relish, pickle relish, corn relish, chili con carne, fried bologna, baked beans, tomato sauce, chopped tomatoes, spiced garbanzos, shrimp salad, canned tuna, celery seed, spinach, carrot relish, chow chow, cucumber relish, green tomato relish, tzatziki & many many more. Our favourite topping combination is DEFINITELY one that we have recently invented. It goes something like this – proof whisky caramelized onions, grated 10-year-old cheddar and Maille Dijon (à l’ancienne). 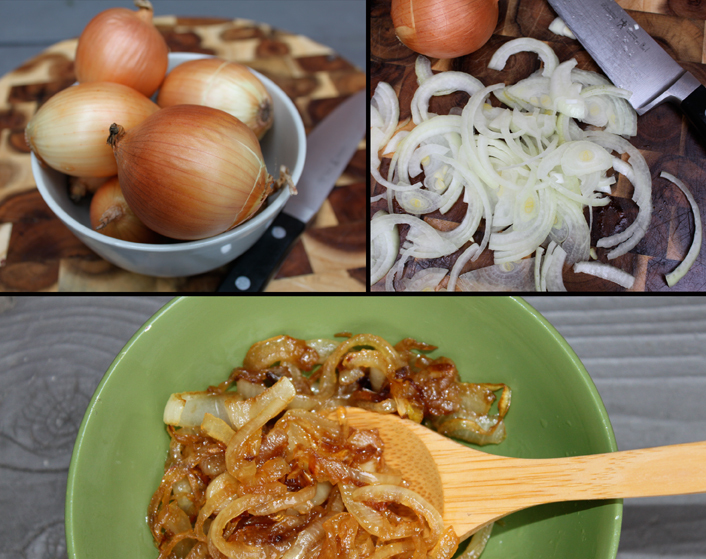 Here is the recipe for proof whisky Caramelized Onions. Heat vegetable oil in sauté pan over high heat. Add butter to pan and brown slightly. Add onions and sear on high for about 2 minutes. Add brown sugar and salt. Continue to cook for another 10 minutes or until onions are lightly browned, stirring constantly to prevent burning. Add whisky. Cook until all liquid is cooked off and onions are a nice brown color. 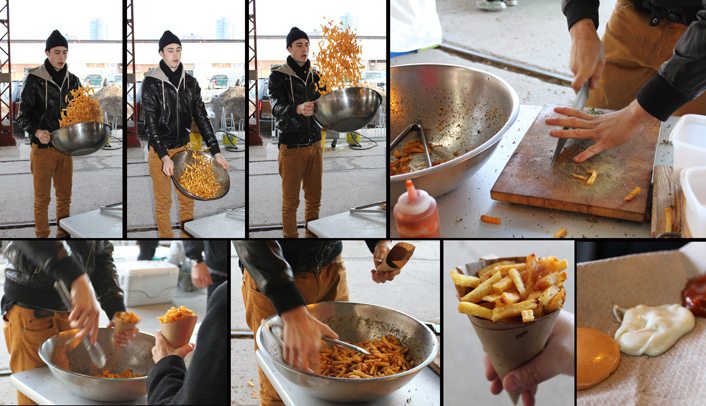 On Saturday we hit the Brickworks for some Buddha Dog (http://buddhafoodha.com/ ), and the Dog was a no-show. The upside to this story is that we FINALLY were able to sample some of Jamie Kennedy’s www.jamiekennedy.ca awesome French fries – and Whoo-ah! These chips are not overrated... JK fries are made from local, organic Yukon potatoes that are fried in sunflower oil and then tossed in a combination of both fine and coarse sea salts and fresh thyme. They are served in hand-rolled parchment cones with your choice of cider mayo, chili mayo or homemade ketchup. 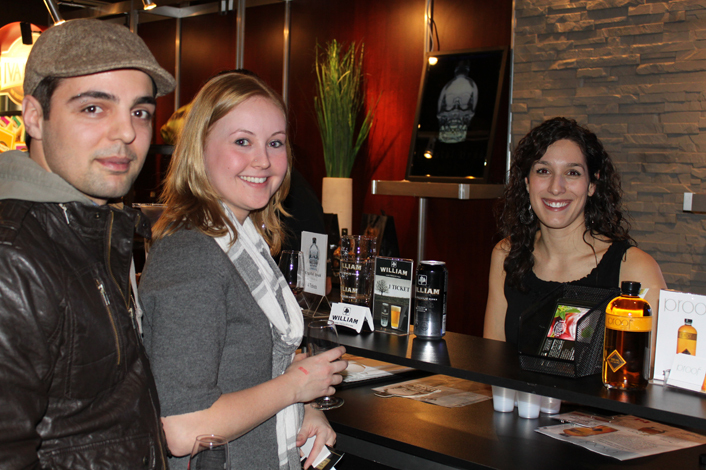 Thanks for stopping in to visit the Diamond Estates (www.diamondestates.ca) booth at the Gourmet Food & Wine Show. It was a great time.